Without dietary fiber, the full functioning of the digestive system is impossible. It helps your body cleanse and increases the immunity. Fiber also contributes to weight loss. So, what is this substance? What is Fiber Good for? Dietary fiber is a plant matter that is part of fruits, vegetables, cereals and other plants. It does not contain anything useful, like vitamins, minerals, proteins etc. Moreover, this substance is not even digested or absorbed by your body. However, nutritionists claim that fiber is as important as fats, carbs and proteins. So, why is it so useful? There are two types of dietary fiber: soluble and insoluble. Soluble fiber, as it gets into your body, absorbs water, and its volume increases, turning into a thick and sticky substance. The same process happens when you put oatmeal in boiled water. Swelling, soluble fiber fills the stomach and provides a feeling of saturation. In a large numbers, soluble fiber is found in apples, oranges, carrots, potatoes, oats, barley and beans. Insoluble fiber passes through the digestive tract, absorbing less water and therefore almost not changing in volume. It stimulates the work of the intestines, accelerating the excretion of undigested food and toxins. Insoluble fiber is rich in bran and other types of whole grains, as well as vegetables. Fiber is important for a set of reasons. It is necessary for the proper functioning of the intestine. Passing it, fiber absorbs and removes toxins, thereby helping the body to digest food. Fiber is a kind of ‘food’ for intestinal bacteria. When fiber is not enough, these bacteria starve and cannot fully synthesize vitamins, amino acids, hormones, microelements etc. Dietary fiber improves the intestinal microbiota (aka microflora). Therefore, it strengthens your immunity, as there are 80% of immune cells in the intestines. That is why it is important to eat fruits and vegetables in winter. Dietary fiber helps to control appetite and to reduce weight effectively. Even a small portion of dietary fiber permanently eliminates hunger; so, avoiding overeating becomes much easier. Fiber reduces the level of sugar and cholesterol in the blood. The risk of developing cardiovascular diseases and diabetes decreases several times. How much fiber should you consume daily? There are some recommended minimums in the chart below. Notice that your doctor may even tell you to consume fiber as is, if you have some health problems. These norms are for an average healthy body. Fiber is found only in plants. Moreover, the less you cook the plant, the more fiber you get. For example, fruits’ peel contains a lot of this substance, so you should eat apples and pears as they are. It is also recommended to drink smoothies and not juices, as first ones contain peel too. In white flour, there is not a gram of fiber, as it remains in the outer layers of grains, from which it is cleaned during processing. Therefore, you should exclude from your diet any usual baking, but instead use whole wheat bread or muesli. Also, replace grinded white rice with a brown or black one, beans or lentils etc. These products are much more useful when talking about fiber content. Let us consider each type of fiber-concentrated products and name the best plants you should eat to consume enough. Fruits are known to be extremely beneficial for health. 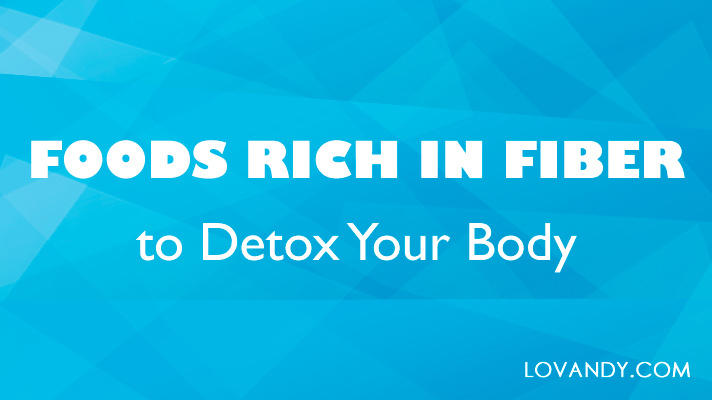 They are loaded with vitamins and essential microelements. So, what about dietary fiber? Let us consider fruits with the highest content. Notice that there are both fibers in any plant, so we state the amount of both soluble and insoluble ones. Avocado is a popular product in many diets. There are many unique substances in it, but the reason you should eat avocados to lose weight is its fiber content. Being an indisputable leader with a content of 6.7 g of fiber per 100 g of weight, avocado is really a nice and beneficial fruit. There are three main sorts of raspberry: red, black and golden. The black one contains the highest amount of fiber with a number of 6.5 g. Red and golden raspberries contain less: 3.7-4 g, which is still a lot, however. Therefore, eat raspberry of any kind as much as you can. You can freeze some for winter too. Of course, apples are in a top 3. These fruits are the most popular and well-known ones. The nutritional value of an apple is indispensable. Moreover, there are 4 g of fiber in a 100 g of apples. Therefore, eating one is always a good idea. Blueberry is used in treatments of many diseases. It is a nice vitamin container, which can strengthen your immunity and help you fight colds. Moreover, this berry is high in fiber content as well. The amount of 3.1 g per 100 g of weight is really big. Pears are almost as beneficial for health as apples are. Their vitamin content is just a bit less. However, there are 2.8 g of dietary fiber in pears. You can make some fruit salads, mixing pears with any other fruits to get a full load of this substance. Oranges are known to be filled with vitamin C. That is why these fruits are recommended to eat as often as you can, especially if you have caught a cold. Talking about fiber, there are 2.2 g of it in oranges. Notice that we are not counting peel here, as it is not very edible. Apricots contain almost the same amount of fiber as oranges do – 2.1 g per 100 g of weight. However, dried apricots contain a lot more – 18 g. That is why this food is extremely popular and is often added to muesli. 200 g of dried apricots are enough to fulfill your daily need of fiber. Peaches are similar to apricots. Dietary fiber content is similar as well – 2.1 g. However, since peaches are hard to find in winter, you can use a jam or dried ones as well. The thing is dried fruits contain less water and vitamins, but the percentage of fiber content conversely rises. Grapefruits are also used in many diets. They are beneficial for diabetics, as grapefruits help normalize sugar levels in blood. Moreover, 100 g of this fruit contains 1.8 g of dietary fiber. It is not that big, but thanks to many other useful properties of grapefruit, it is a nice meal for a diet. Bananas are very calorized fruits. Even though there are many vitamins and minerals in them, they are not recommended to eat when trying to lose weight. Nevertheless, there are 1.7 g of fiber in bananas, so they do help your intestines work well. Vegetables are also high in fiber content, as any other plants are. There are both soluble and insoluble fibers in vegetables, as well as in fruits. The amounts we state are for the whole fiber content. These vegetables are not very popular as food. However, they are really beneficial for health. There are many vitamins and useful minerals, but the reason you should eat some is actually in fiber content. There are 8.6 g of this substance in 100 g of artichokes. Therefore, no vegetable or fruit can compare with them. Moreover, artichokes are pretty tasty as well. Just boil some and eat with a sauce. Almost all the beans are useful for health, and all of them are high in fiber content. However, green peas are the best about it. There are 5.5 g of fiber in them, so it is a nice idea to eat some in a salad. You can even use them as a main dish. Another not-so-popular vegetable is parsnip. It is not widely used in modern cuisine, though it should be. There are 4.9 g of fiber in 100 g of parsnips. By the way, there are dozens of nice recipes with this vegetable. Basically, you can do with it anything you want: boil, bake, roast, even add to a dough for pies. These little vegetables are nice additives for a soup or a salad because of their vitamins and fiber content. There are 3.8 g of it in Brussels sprouts. That is why it is so widely used in vegetarian meals. Every child hates broccoli. Perhaps, not many adults like them too. However, we all know that this vegetable is one of the most beneficial for health. 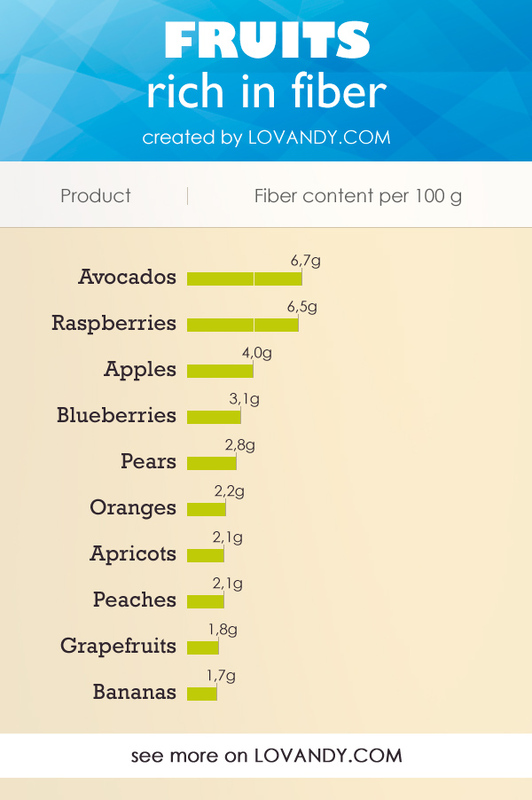 Talking about fiber, there is a lot of it as well – 3.3 g per 100 g of weight. Potato is probably the most popular vegetable all over the world. It is high in vitamin and mineral content. Sweet potatoes are better than regular ones not only for the taste, but for fiber content too. It is same to broccoli – 3.3g. Okra is used in diets as a low-calorized source of B and C vitamins. This plant might not have a significant taste, but the benefits are really nice. Okra is high in fiber as well with the amount of 3.2g. Everything mentioned makes this vegetable useful for diabetics. Fennel contains 3.1 g of fiber per 100 g of weight. It is popular to eat leaves of this plant, but we are talking about a root and seeds here. Cool thing about them, they are widely used in spices. So, you can simply season some of your favorite meals to get a small amount of fiber. There are many vitamins in carrots; that is why they are added to many meals, such as soups, garnishes and even juices. Fiber is also in carrot’s content. 3.0 g of this substance makes this vegetable a nice remedy for intestines diseases. Being as infamous amongst children as broccoli, spinach is also known for its high vitamin content. That is why you truly should eat some regularly. Fiber is also pretty high in spinach with 2.4 g per 100 g of weight. Add this vegetable to any salad to make it much more useful. Cereals are the best products when talking about fiber. They are literally filled with it, as fiber is the main building material for any plant. That is why it is recommended to eat cereals for breakfast. This way you help your intestines work properly for the whole day, and get a full pack of vitamins too. Let us consider the highest fiber content cereals. Even though barley is not so popular to eat as is, this cereal contains the biggest amount of fiber. There are 15.6 g in it, which is a huge volume, comparing to fruits and vegetables. 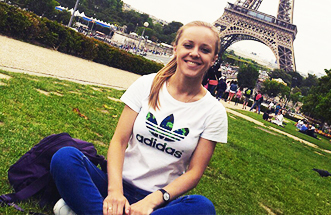 Therefore, it is a good idea to find some nice recipe and eat barley in the morning. Lentil is often used in many cuisines as a main dish. This is due to its high caloric value and fiber content. 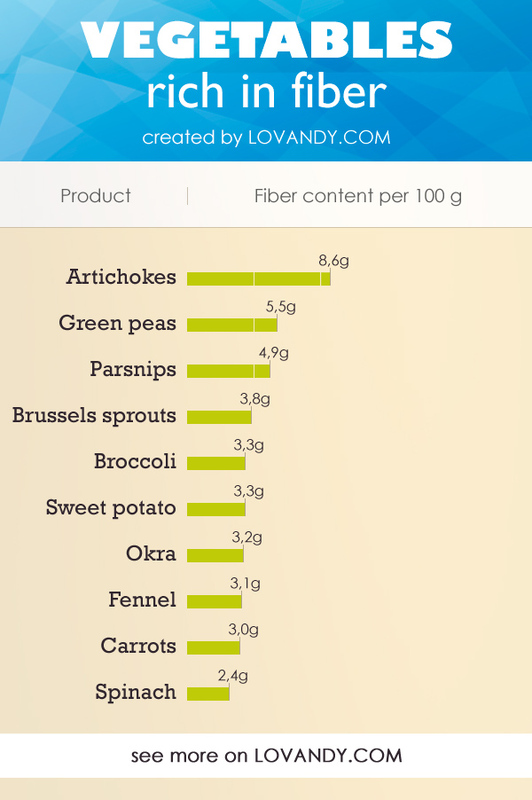 There are 10.7 g of fiber in lentils. This means that by eating some you will feel no hunger for a long time. By the way, this plant is really delicious. Of course, oatmeal is in this list. This beneficial cereal is something you cannot live without. No matter whether you are on a diet or not, a bowl of oatmeal in the morning is always a good idea. And if you add some fruits or berries to it, you will get even more fiber, which is, by the way, 10.2 g in 100 g of oatmeal. The definition of ‘muesli’ may vary, as there might be different ingredients. Nevertheless, there are 5-9 g of fiber in any bowl of this meal, depending on what components outweigh. You may add some fruits to muesli too, and eat it with milk, yogurt or anything else you like, which makes them a multifarious meal. 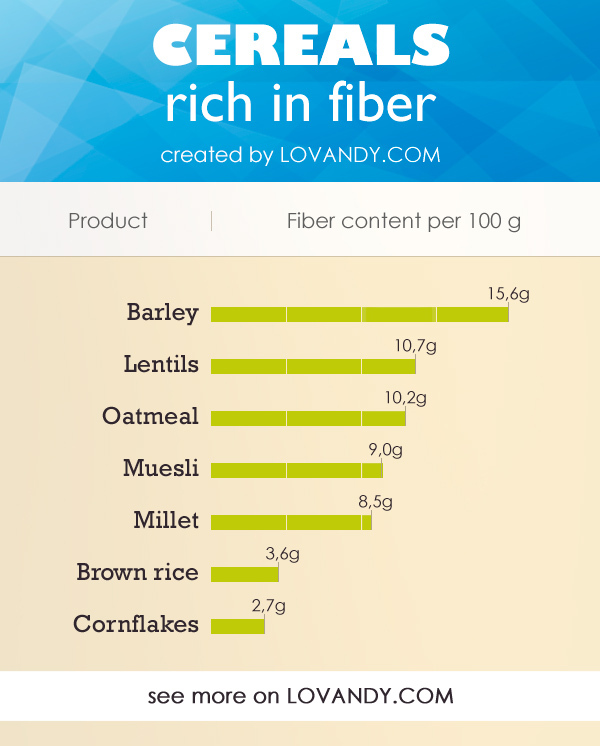 Millet is not as popular as oatmeal, and its fiber content is fewer with 8.5 g. However, this cereal does contain some unique substances. In addition, you will probably not want to eat oat in every morning. So, millet is a nice replacement. We have said before that brown rice is more useful than a regular white one. That is why we recommend eating it if you want to get a nice amount of fiber. There are 3.6 g in a brown rice, which is three times more than in white one. This meal is probably the most desirable one for children. Since everything mentioned before does not have an expressive taste, cornflakes are actually sweet. Even though they are not that rich in fiber with the amount of 2.7 g, it is enough for a preschooler to get some. Let us make a general chart for all the foods that are high in fiber. You can check it out whenever you ‘get tired’ of some vegetable or cereal and want to switch for something else. Some foods may contain more soluble fiber, and others more insoluble, but the difference is not significant. Therefore, eat anything of the mentioned you like. Fiber is an extremely important substance. When calculating your daily intake of calories, fats, carbs and proteins, do not forget about fiber, as it is very useful indeed. It helps your intestines work well and cleanses it nicely, therefore allowing the microflora stay healthy. This even affects your immunity. There are many different foods with fiber in content, so you can choose the one you like, and make a diet on its basis. Welcome to the beauty wiki for women, the website that was created to help you to become more beautiful and healthier. Here you'll find lots of useful information about food benefits and harms, physical and emotional health, work and leasure balance, beauty care. Enjoy!